Senior leader in Hamas Movement Dr. Mousa Abu Marzouk said Friday that the recommendations made during the Board of Trustees of the Yasser Arafat Foundation (YAF) meetings stressed the importance of activating all reconciliation agreements without exception. Most of the participants in YAF Board Trustees meeting held recently in Cairo have wondered about “the way out of our national crises,” Abu Marzouk wrote on his Facebook page. "We are facing failed negotiations, standstill reconciliation, a humanitarian disaster in the besieged Gaza Strip, and a legal failure in US courts, he added. Abu Marzouk further recalled the main points that were nationally agreed upon including the convening of the Provisional Leadership Framework of the PLO, the resumption of the Palestinian Legislative Council sessions, and the formation of a unity government with the participation of all Palestinian factions. He also stressed the key priorities of the next phase mainly solving Gaza crises, unifying governmental institutions and laws in Gaza and West Bank, Gaza reconstruction, holding the elections, and mending relations between Egypt and Hamas. The Islamic scholar and head of the Tunisian Ennahda movement Rashid al-Ghannouchi hailed the Palestinian people’s steadfastness in the Gaza Strip. 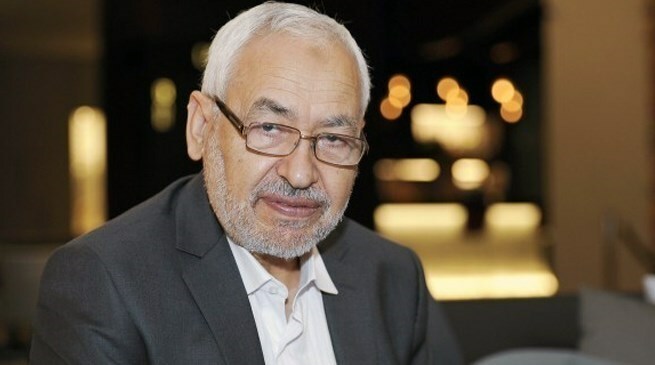 Speaking at the First International Scientific Conference of the Faculty of Rabat University in Gaza, al-Ghannouchi said the Islamic nation will not be well unless Palestine is liberated. "Only when Palestine is liberated, the nation will be fine. Despite all the challenges, we must adhere to our strong beliefs," he said. "We must liberate our nation from the causes of vulnerability and adhere to our faith and be united, only then we can be the victorious." Tunisia’s Islamic scholar has many books, articles, and publications calling for Jihad for the liberation of Palestine. Young and ambitious, with a ready smile and a quick wit, Israeli far right leader Naftali Bennett is on a mission to prevent the creation of a Palestinian state. If, as widely expected, he takes on defense or another key portfolio after next month's election, that mission will take a big step closer to fulfillment, something his critics say could stir conflict and deepen Israel's international isolation. Forty-two-year-old Bennett, who has expanded the appeal of his pro-settler Bayit Yehudi party to younger, more secular Israelis, is undeterred, saying the alternative would be worse - the end of Israel and endless war. "Even if the world pressures us, we will not willingly commit suicide," the former tech entrepreneur and army commando told Reuters on the campaign trail. Visiting a mall in the Israeli town of Ashkelon and surrounded by a crowd of cheering supporters, Bennett stopped to talk with stall owners eager to shake his hand and chat while teenagers took selfies with him on their mobile phones. In the 2013 election, Bayit Yehudi tripled its seats under Bennett's new leadership to become a major partner in right-wing Prime Minister Benjamin Netanyahu's coalition government. Bennett became economy minister. The party is looking to boost its influence in the election on March 17, held early after the Netanyahu fired two centrist ministers, saying he could no longer tolerate their opposition to his policies. 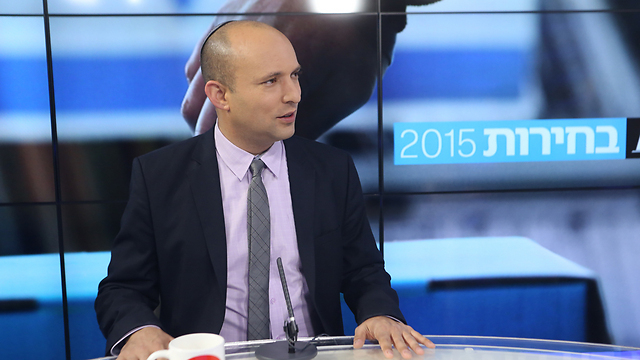 Polls predict Bayit Yehudi will hold onto or increase its seats, currently 12, in the 120-member parliament. If Netanyahu's Likud, which has a narrow lead in the polls, comes top again, Bayit Yehudi is likely to be a core part of the next coalition. The Palestinians want to establish a state in the West Bank and East Jerusalem, which have been occupied by Israel since 1967, and in the Gaza Strip, blockaded by Israel and Egypt and under the control of Islamist Hamas. Bennett cites regional turmoil and Palestinian rocket fire into Israel during last summer's Gaza war as reasons why it must not relinquish the West Bank as it did the Gaza Strip in 2005. Israel, he said, should annex "Area C" of the West Bank, where more than 350,000 Israeli settlers live under full Israeli military and civil control. Under interim peace deals, the Palestinians, whose population stands at around 2.8 million, have limited self-rule in the rest of the West Bank. "The idea is to create an 'autonomy on steroids', for the Palestinians to have their own elections, freedom of movement, build as much as they want, their own education system, pay their own taxes," Bennett said. "I don't want to govern them." Palestinians in Area C, which makes up 60 percent of West Bank territory, would be offered Israeli citizenship, he says. His opponents dismiss his plan as immoral, simplistic and impossible. But Bennett hopes to win the hearts and minds of Israelis and eventually persuade the world that his "Stabilization Plan" is the right way to go. "Will everyone be convinced tomorrow? No. We need to work at it," he said. As far as he is concerned, he has broken a taboo. "Even if the entire world is convinced if we sever Judea and Samaria (the biblical term for the West Bank), give it to the Arabs, carve up Jerusalem, that this will bring peace on earth, I am convinced of the opposite, it will bring endless war." Born in Israel to parents from San Francisco, Bennett spent years in the United States before he sold his anti-fraud software company to US security firm RSA for $145 million. Addressing an audience of immigrants in Tel Aviv, he quips and jokes, drawing laughter and applause. He speaks in American-accented English, reminiscent of Netanyahu, to whom he was an aide in 2006-2008. Since taking over Bayit Yehudi in 2012, Bennett has sought to revamp the party, bringing in younger faces and expanding its appeal to broader sectors, especially via social media. Bennett, an Orthodox Jew, lives in an affluent suburb of Tel Aviv with his non-religious wife. Critics call him the friendly face of an extremist party that includes hardline settlers and ultra-nationalists strongly opposed to Palestinians. In recent weeks, some Bayit Yehudi lawmakers have also drawn criticism for anti-gay remarks, with one quoted as saying he was "a proud homophobe". At the conference in Tel Aviv, Bennett was heckled by gay activists before they were escorted out by bodyguards. "I respect you guys," Bennett said, later explaining his view was "live and let live." He said he never planned to enter politics but Israel's 2006 war against Lebanon's Hezbollah militant group changed his mind. "I had just sold a company for 145 million dollars. I was supposed to be partying, flying off to the Caribbean and instead I found myself fighting in south Lebanon against terrorists who want to destroy my state." That convinced him, he said, to serve his country through political leadership. "I am here as an emissary for the people of Israel." 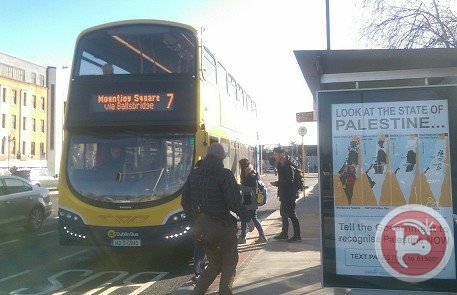 A Palestinian solidarity group in Ireland has launched a billboard campaign, Wednesday, to urge the Irish government to support the recognition of Palestine. Solidarity organization "Sadaka" said that former Irish foreign minister Micheál Martin, Sinn Féin leader Gerry Adams, and PA ambassador to Ireland, Ahmed Abdelrazek, urged the Irish government to recognize a Palestinian state based on the two state parameters, as part of the campaign. John Douglas, President of the Irish Congress of Trade Unions, said: "The Dáil and Seanad have given the government a clear mandate to recognize the state of Palestine... Ireland's stated policy is that it supports a two state solution in Palestine and Israel. Ireland already recognizes Israel – we should now recognize the State of Palestine." Chair of Sadaka, Marie Crawley, said recognition of Palestine would put pressure on Israel to contribute constructively to the peace process. "Israel, as an occupying power, continues to hold a veto over Palestinian statehood. No country should deny another nation its right to statehood. And, as the maps on these billboards powerfully demonstrate, time is running out for the establishment of a Palestinian state." The adverts will appear on billboards, buses, bus shelters and train stations in Dublin. 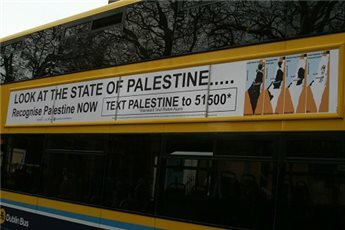 In December of 2014, Irish lawmakers urged their government to recognize Palestine, in a symbolic motion that sailed through parliament unopposed. The non-binding motion, agreed by lawmakers in Dublin, called on the government to "officially recognize the State of Palestine, on the basis of the 1967 borders with East Jerusalem as the capital, as established in UN resolutions." The anonymous but eminent British street artist known as Banksy has again taken aim at Israeli policies regarding the Palestinians, sneaking into the Gaza Strip and filming the devastation there in the wake of last summer's IDF Operation Protective Edge, which ended six months ago. The two-minute video, entitled "Make this the year YOU discover a new destination" was uploaded to his website and YouTube on Wednesday. Like many of Banksy's murals and other art it is politically charged and whimsical at the same time. The film begins with the title against a backdrop of an airplane wing, blue skies and fluffy clouds. But the footage soon switches to the tag line "Welcome to Gaza" and scenes of ruined buildings in Gaza, with children perched among the rubble. "Well away from the tourist track", the video states, explaining that the area was accessed "via a network of illegal tunnels". The film says Gaza is hemmed in on three sides by its "friendly neighbors" the Israelis, and can only be entered through one of the tunnels shown. It makes no mention of the fact that the border between Egypt and Gaza is also closed and that the Egyptian government has denounced Hamas as terrorists. Nor does it show images of Hamas or its own use of rockets during the conflict. "The locals like it so much they never leave (Because they're not allowed too)," the video says, and shows an image of Israeli troops. "Development opportunities are everywhere" and there is "plenty of scope for refurbishment", the subtitles say, noting that 18,000 homes were destroyed in the fighting and showing IAF footage of bombing in Gaza. The video also incorrectly states that no cement has been allowed into Gaza since the summer war - cement is allowed to enter the strip under oversight. Towards the end, the camera focuses on a mural of a playful-looking kitten, painted by Banksy, with a man looking at it and saying in Arabic that at least the cat found something to play with, because the children in Gaza have nothing. Elsewhere on his website, Banksy says that during the filming a local man had asked him what the meaning was of the kitten. "I explained (that) I wanted to highlight the destruction in Gaza by posting photos on my website - but on the Internet people only look at pictures of kittens." The film ends with a message painted on a wall: "If we wash our hands of the conflict between the powerful and the powerless we side with the powerful - we don't remain neutral." This is not the first time that the British artist has used his street drawings to criticize the Israeli government. A range of his work is daubed on the West Bank separation fence, including the silhouette of a girl being carried into the air by the bunch of balloons she is holding in her hand. After teasing us with a single shot on Instagram earlier this morning (GMT time), Banksy finally revealed the location of the first piece which is Gaza in Palestine. Inspired by a sculpture of Niobe, a Greek mythological figure, the first piece is entitled "Bomb Damage" and obviously with Banksy, the placement is just on point. Niobe's children were killed out of spite and then in her mourning she turned into a stone that was constantly weeping. On top of that, the elusive British street artist took the opportunity to reveal four new pieces which you will be able to find around Gaza. Gaza is often described as 'the world's largest open air prison' because no-one is allowed to enter or leave. But that seems a bit unfair to prisons - they don’t have their electricity and drinking water cut off randomly almost everyday. -- Banksy A local man came up and said 'Please - what does this mean?' I explained I wanted to highlight the destruction in Gaza by posting photos on my website – but on the internet people only look at pictures of kittens. -- Banksy Just like in New York City back in 2013, one of the new piece is text based and reads: "If We Wash Our Hands Of The Conflict Between The Powerful And The Powerless We Side With The Powerful - We Don't Remain Neutral". Finally, Banksy drops a strong statement with a 2 minute long video which document his recent trip to Palestine. Hit the jump to discover more images on these powerful artworks plus the video and as usual keep your eyes peeled on StreetArtNews for the latest Banksy updates. The Popular Front for the Liberation of Palestine (PFLP) called on the Palestinian factions to hold an emergency meeting to address the worsening economic and living conditions in the blockaded Gaza Strip. The meeting aims at coming up with resolutions to the current crises threatening the social security and peace in Gaza. The PFLP stressed, in a statement on Wednesday, the need for unifying Gaza relief channels and maintaining its neutrality to guarantee its delivery to the affected people in last summer’s Israeli aggression on Gaza. The leftist faction urged the Palestinian factions to call for cutting down university fees for one year due to the current bad economic conditions in the besieged Strip. It also called for enhancing the social fund to cover more students. The PFLP also called on the Palestinian Authority (PA) and its president Mahmoud Abbas to allow the delivery of money allocated for Gaza relief to the services and economic sectors in order to alleviate some of Gaza's problems and to avoid more tragedies. The Palestinian leftist faction also called on the PA Ministry of Social Affairs to pay the poor people allocations on a monthly basis, and asked the ministry to prioritize the issue of those allocations since they constitute the main income source for more than 50% of Gaza’s population. The PFLP demanded the formation of popular committees to enhance the public awareness of the danger of committing crimes and to chase criminal gangs in cooperation with the police in the Strip. It also called on the Palestinian factions to form joint operation rooms to follow up the Israeli siege on Gaza in addition to Gaza reconstruction, power cut off and reconciliation files, stressing the need for unity among Palestinian factions in terms of the confrontation of the Israeli occupation and political decision making. 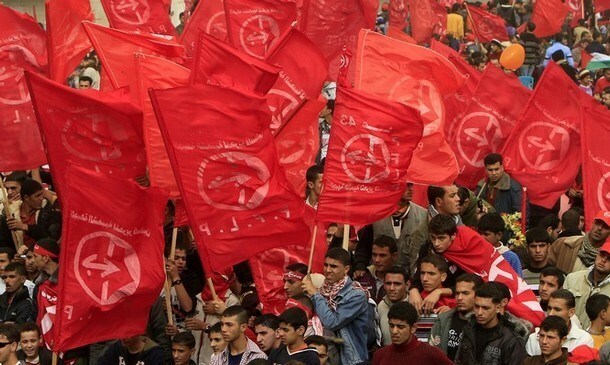 “The Palestinian unity government as well as the UNRWA and NGOs should allocate special budget to fund the Palestinian youth sector and the unemployed graduates within small projects programs”, said PFLP. The PFLP affirmed that its statement constitutes an urgent patriotic call to save the Palestinian people in the blockaded enclave from marginalization, negligence, corruption, and internal division. 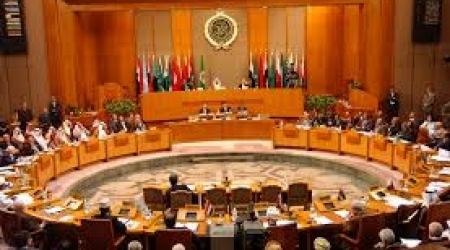 The Arab League has called on the UN and other international human rights committees to hold to their responsibilities in providing protection, for the Palestinian people and their holy sites, from ongoing Israeli attacks. Al Ray reports that, in a statement issued by the Arab league on the anniversary of Ibrahimi Mosque massacre, it stressed the importance of confronting the Israelis and halting the illegal practices against the Ibrahimi and al-Aqsa mosques, as they are in contradiction the Fourth Geneva Convention and the obligations set forth as an occupying power. The Hebron massacre was a shooting attack carried out by American-born Israeli, Baruch Goldstein, a member of the far-right Israeli "Kach" movement, who opened fire on unarmed Palestinian Muslims praying inside the Ibrahimi Mosque (or Mosque of Abraham) at the Cave of the Patriarchs, in the occupied West Bank city of Hebron. The shooting took place on February 25, 1994, during the overlapping religious holidays of Purim and Ramadan, leaving 29 male worshippers dead and 125 wounded.The attack ended only after Goldstein was overcome and beaten to death by survivors. The Arab league explained that such a crime backs a dangerous policy which devastates any peace solution. It holds the state of Israel responsibile for the massacre, considering it to be a part of Israeli terrorist policy in occupied Palestine. It also condemned colonial settler practices against Palestinians, confiscating lands and expelling the inhabitants in order to establish Israeli settlements and housing units. It added that the massacre reflected the racist nature of the Israeli regime and revealed its inherent ideology to be full of hatred. Israel used the crime to implement its authority over the mosque. This massacre violated all the regulations and norms which protect the right of worship, while the Israeli occupation uses military force to impose a new reality. 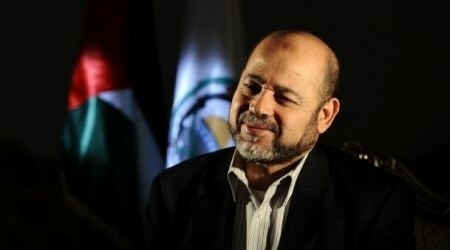 Deputy head of Hamas political bureau, Ismail Haneyya, reiterated the group’s adoption of a strategy of non-interference regarding Egyptian affairs, holding the Israeli occupation responsible for the upshots of any projected aggression on Gaza. 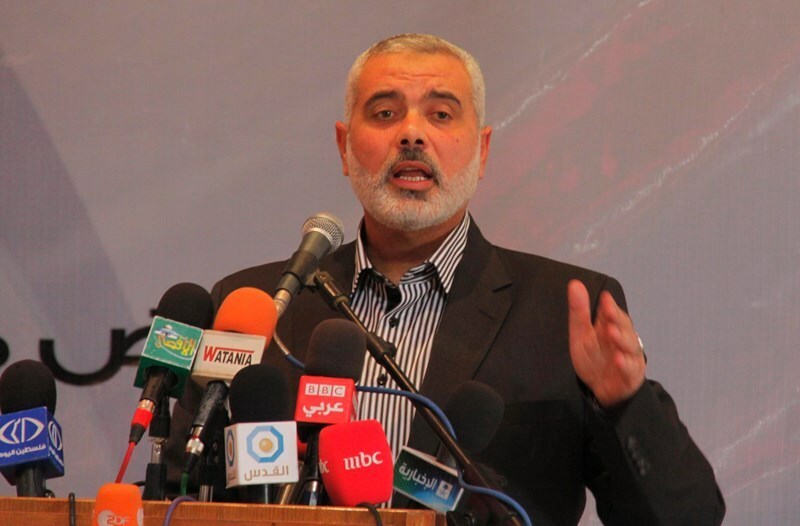 Speaking at the International Scientific Conference on Palestine, held in Gaza on Tuesday afternoon, Haneyya voiced Hamas’s firm rebuff of any attempt at blacklisting Hamas as a terror group. Hamas has never meddled in the Egyptian affairs; nor has it tampered with Egypt’s security, he said. He slammed the Palestinian Authority and its premier for having been dragging their feet vis-à-vis the tragic state of affairs in Gaza. “From my national position, I call on the government to come to Gaza, take up its national responsibility, and stop withholding salaries of civil servants because of a certain affiliation or opinion,” he stated. Tackling the reconciliation file, Haneyya said Hamas stepped down willingly for the sake of national reconciliation and the Palestinian people. “Reconciliation does not come with government line-ups only”, he stated, wondering why and who has been standing as a stumbling block in the consensus path. “We are ready to put reconciliation files into effect. We urge all parties to implement the bonds of the deals struck in Doha, Cairo, and Shati,” Haneyya added. “We do not opt for the monopolization of national decision-making. If declarations of war and peace should make part of a unanimous national decision, then so should be all other decisions,” he explained. “We are the victims of aggression, of wars, and of the blockade. Most of our victims have been civilians whereas Israel’s have been soldiers,” he concluded. Haneyya’s speech came during the inaugurating sessions of the International Scientific Conference: Palestine, The Reasons of Occupation and Motives of Victory”. A number of officials, including Turkish PM, Ahmad Davutoglu, former Tunisian President, Moncef al-Marzouki, former Malaysian PM, Mahatir Mohamed, and head of the Tunisian Nahda Party, Rashed Ghannouchi, are expected to partake in video conferences to be aired via live streaming. Chairman of the conference, Riad Shaheen, said the forum aims at rehabilitating the role of elites and intellectuals in restoring optimism in the region and spawning a cultural renaissance.